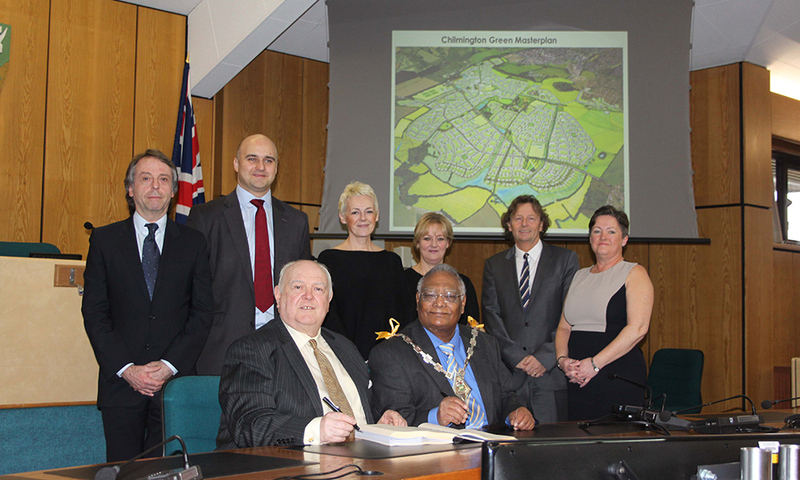 Following several years of consultation and masterplanning, Ashford Borough Council’s planning committee approved Hodson Developments Chilmington Green development. A mixed use development which applies nationally recognised Garden City principles for the 21st century. The focus now turns to delivering a really great place of high quality with construction now started on site. Chilmington Green will be a standalone development of 5,750 quality homes, a district centre and community infrastructure which will create over 1,000 jobs in the next 20 years, coming forward in four main phases with around 300 homes delivered per year. The development will provide towards local amenities including four new schools, shops, healthcare, sports and leisure facilities and community facilities. While Chilmington Green will not be a Garden City in terms of its size, it will reflect many of the design principles of the successful garden cities – tree-lined streets, a spacious layout with high quality public spaces and a strong local community managing local facilities. Cllr Gerry Clarkson, Leader of Ashford Borough Council, said: “From the inception of the Chilmington Green project the ambition has been to create a place of special character with a strong community feel. “Chilmington Green is one of our Big 8 projects and its delivery is key to meeting the borough’s growth needs with masterplanning pointing firmly towards a high quality, carefully planned development with open spaces and quality public realm – a place where families and people of all ages will want to live, enjoy and call home. The project has already won an award for Strategic Planning at the 2014 Placemaking Awards, demonstrating ‘how a development plan, spatial plan or master plan has, or will have, a positive impact on the physical or environmental quality of a place or the economic or social well-being of its community’. There is a real commitment to delivering the best at Chilmington Green with a Quality Charter, outlining 32 commitments to making a quality place and vibrant community.